Listen very carefully to your domain experts - the people whose job you're automating or assisting in software. Learn the jargon that they use, and help them to come up with new jargon, so that every concept in their mental model is named by a single precise term. Use those terms to model your software; the nouns and verbs of the domain expert are the classes and methods you should use in modelling. Whenever there is a discrepancy between your shared understanding of the domain, go and talk to the domain experts again, and then refactor aggressively. This sounds great in theory, but in practice we often find that our business logic escapes from our model objects; we end up with logic bleeding into controllers, or into fat "manager" classes. We find that refactoring becomes difficult: we can't split a large and important class, because that would seriously impact the database schema; or we can't rewrite the internals of an algorithm because it has become tightly coupled to code that exists for a different use-case. The good news is that these problems can be avoided, since they are caused by a lack of organisation in the codebase. In fact, the tools to solve these problems take up half of the DDD book, but it can be be difficult to understand how to use them together in the context of a complete system. I want to use this series to introduce an architectural style called Ports and Adapters, and a design pattern named Command Handler. I'll be explaining the patterns in Python because that's the language that I use day-to-day, but the concepts are applicable to any OO language, and can be massaged to work perfectly in a functional context. There might be a lot more layering and abstraction than you're used to, especially if you're coming from a Django background or similar, but please bear with me. In exchange for a more complex system at the outset, we can avoid much of our accidental complexity later. The system we're going to build is an issue management system, for use by a helpdesk. We're going to be replacing an existing system, which consists of an HTML form that sends an email. The emails go into a mailbox, and helpdesk staff go through the mails triaging problems and picking up problems that they can solve. Sometimes issues get overlooked for a long time, and the helpdesk team have invented a complex system of post-it notes and whiteboard layouts to track work in progress. For a while this system has worked pretty well but, as the system gets busier, the cracks are beginning to show. "What's the first step in the process?" you ask, "How do tickets end up in the mail box?". "Well, the first thing that happens is the user goes to the web page, and they fill out some details, and report an issue. That sends an email into the issue log and then we pick issues from the log each morning". "So when a user reports an issue, what's the minimal set of data that you need from them?" "We need to know who they are, so their name, and email I guess. Uh... and the problem description. They're supposed to add a category, but they never do, and we used to have a priority, but everyone set their issue to EXTREMELY URGENT, so it was useless. "But a category and priority would help you to triage things?" "Yes, that would be really helpful if we could get users to set them properly." This gives us our first use case: As a user, I want to be able to report a new issue. We will always define where our use-cases begin and end. We won't have business processes that are strewn all over the codebase. We will depend on abstractions, and not on concrete implementations. We will treat glue code as distinct from business logic, and put it in an appropriate place. Firstly we start with the domain model. The domain model encapsulates our shared understanding of the problem, and uses the terms we agreed with the domain experts. In keeping with principle #2 we will define abstractions for any infrastructural or technical concerns and use those in our model. For example, if we need to send an email, or save an entity to a database, we will do so through an abstraction that captures our intent. In this series we'll create a separate python package for our domain model so that we can be sure it has no dependencies on the other layers of the system. Maintaining this rule strictly will make it easier to test and refactor our system, since our domain models aren't tangled up with messy details of databases and http calls. Around the outside of our domain model we place services. These are stateless objects that do stuff to the domain. In particular, for this system, our command handlers are part of the service layer. Finally, we have our adapter layer. 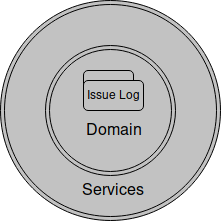 This layer contains code that drives the service layer, or provides services to the domain model. 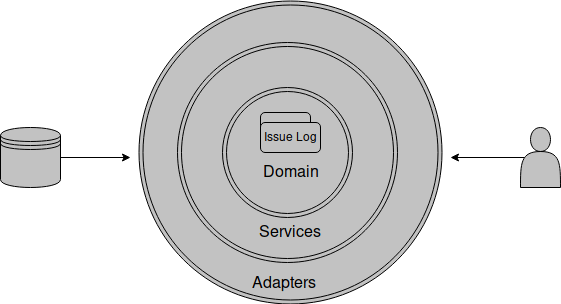 For example, our domain model may have an abstraction for talking to the database, but the adapter layer provides a concrete implementation. Other adapters might include a Flask API, or our set of unit tests, or a celery event queue. All of these adapters connect our application to the outside world. In keeping with our first principle, we're going to define a boundary for this use case and create our first Command Handler. A command handler is an object that orchestrates a business process. It does the boring work of fetching the right objects, and invoking the right methods on them. It's similar to the concept of a Controller in an MVC architecture. First, we create a Command object. We should try to avoid the verbs Create, Update, or Delete (and their synonyms) because those are technical implementations. When we listen to our domain experts, we often find that there is a better word for the operation we're trying to model. If all of your commands are named "CreateIssue", "UpdateCart", "DeleteOrders", then you're probably not paying enough attention to the language that your stakeholders are using. If the only way to change state in the system is through a command, then the list of commands tells me all the things I need to test. There are no other code paths that can modify data. Because our commands are lightweight, logic-free objects, we can create them from an HTTP post, or a celery task, or a command line csv reader, or a unit test. They form a simple and stable API for our system that does not depend on any implementation details and can be invoked in multiple ways. In order to process our new command, we'll need to create a command handler. Command handlers are stateless objects that orchestrate the behaviour of a system. They are a kind of glue code, and manage the boring work of fetching and saving objects, and then notifying other parts of the system. In keeping with principle #3, we keep this in a separate layer. To satisfy principle #1, each use case is a separate command handler and has a clearly defined beginning and end. Every command is handled by exactly one command handler. Fetch the current state from our persistent storage. Notify any external systems that our state has changed. We will usually avoid if statements, loops, and other such wizardry in our handlers, and stick to a single possible line of execution. Command handlers are boring glue code. This handler violates our glue-code principle because it encodes a business rule: "If an issue is already resolved, then it can't be resolved a second time". This rule belongs in our domain model, probably in the mark_as_resolved method of our Issue object. Commands are logic-free data structures with a name and a bunch of values. They form a stable, simple API that describes what our system can do, and doesn't depend on any implementation details. Each command can be handled by exactly one handler. Each command instructs the system to run through one use case. A handler will usually do the following steps: get state, change state, persist state, notify other parties that state was changed. Let's take a look at the complete system, I'm concatenating all the files into a single code listing for each of grokking, but in the git repository I'm splitting the layers of the system into separate packages. In the real world, I would probably use a single python package for the whole app, but in other languages - Java, C#, C++ - I would usually have a single binary for each layer. Splitting the packages up this way makes it easier to understand how the dependencies work. desc = "My mouse won't move"
There's not a lot of functionality here, and our issue log has a couple of problems, firstly there's no way to see the issues in the log yet, and secondly we'll lose all of our data every time we restart the process. We'll fix the second of those in the next part.